Apple's chief executive Tim Cook sat alone onstage as he presided over the company's annual shareholder meeting, fielding questions and detailing various aspects of his company's business. Among the topics he discussed were sales of the latest iPhone models, Apple's pace of acquisitions, and the growth of Apple TV. An initial official corporate meeting session asked the company's shareholders to approve the reelection of members of the Board of Directors, ratify the appointment of its accounting firm and approve a series of 'good governance' corporate Articles amendments delayed from the previous year (all of which were approved by a 90 percent or greater landslide in preliminary votes). There were also a series of outside shareholder proposals ranging from an idea to create a special board committee to advise the company on human rights issues; a request to "report involvement with certain trade organizations" motivated by political goal; a suggestion to allow shareholding groups to nominate their own board members; and a new proposal backed by the EFF asking for a corporate response to NSA surveillance issues (all of the ideas were soundly rejected in the initial count of votes). Once the official business completed, Cook recited a broad range of prepared remarks and took questions from the audience. He also noted that within the next 60 days, Apple's board would announce the results of deliberations on adjustments to the company's dividend and stock buyback programs. Starting with the new MacBook Air, Cook called attention to a series of developments since the last shareholder meeting. He stated that reviews had called the machine the "best laptop ever made," and observed that its "fantastic all-day battery life" was the result of everyone at Apple moving "in the same direction to pull this off," from battery chemistry and other aspects of hardware design to the software and implementation of services. Cook also addressed the launch of the iPhone 5c and 5s, noting that the two phones both outsold Apple's previous products in the middle tier and the high end, a moderate rebuke of reports that have insisted that the iPhone 5c is a "failure" for not having sold even better than it did. He called particular attention to Touch ID, stating that it has been "incredibly well received." Cook also mentioned the company's new A7 Application Processor, noting that Apple has invested in silicon expertise to the point where he believed the company now operates a world leading chip design facility. He also called attention to Apple being first to put a 64-bit architecture in a mobile phone, providing power to run "desktop class" applications. The new iOS 7 got a mention, with particular attention given to the fact that 82 percent of Apple's users were now on the latest release, compared to just 1.8 percent among the "others," a clear jab at Google's Android. iTunes Radio and iPad Air also got glowing mentions. Cook also made specific mention of Apple TV, which he noted generated $1 billion in revenue in 2013, adding that it's now "hard to call it a hobby these days." And amid a PC market that is retracting, Cook drew attention to the fact that Mac sales had grown by 19 percent. Overall, Apple's $171 billion in revenue, $14.4 billion in growth and $58 billion in profits were higher than any tech company has ever reported, comparable only to companies pumping oil. For a sense of scale, Cook also compared Apple's Services and Software business, which generated $16 billion in revenue in 2013, to Starbucks, a company that just reported the best year in its 42-year history. Cook had first suggested he would announce new products during the event, before pausing after wild applause to note that he had only been joking. He did however note that Apple's research and development spending had ballooned by 32 percent in 2013, despite already being a big number. Over the past roughly 16 months, Cook also noted Apple had acquired 23 companies, but added that the company was not in a race to buy up the greatest number of firms or to pay the most money for them, a quip that appeared to be directed at Facebook's breathtakingly expensive purchase of WhatsApp or the similarly vast (and in retrospect, disastrous) purchase of Motorola Mobility by Google. Cook also focused attention on Apple's growth, and investments, with BRIC (Brazil, Russia, India and China), noting that in 2010 Apple recorded $4 billion in BRIC revenues, while last year that had grown to $30 billion. He also called attention to China Mobile, noting that Apple had focused its launch on 4G service in just 17 cities, but expected to expand that to 200 markets there by the end of 2014. Cook added that Apple now has 800 million iOS users and has handled over 16 trillion push notifications, with 40 billion new ones occurring every day. Apple also delivers several billion iMessages and FaceTime requests every day. Cook added that iPad now accounts for 78 percent of all tablets used throughout the enterprise. Cook also spent significant time discussing Apple's work in being social responsible, including the $100 million that the company was donating to ConnectEd to bring technology to disadvantaged U.S. school districts, and the $70 million Apple had donated to Project(RED) in addition to the $50 million raised by the company's design chief Jony Ive at a charity auction benefit. Cook bristled with a reply that "we do a lot of things for reasons besides profit motive," and recommended that anyone who had a problem with that "should get out of the stock." Apple's aim in environmental issues is to "leave the world better than we found it," Cook said, detailing plans to achieve 100 percent renewable power across the company, including the construction of the largest solar installation built and owned by a private, non utility company. Cook said Apple's environmental efforts also made economic sense, but when challenged by conservative shareholder activism group to pledge that Apple wouldn't do anything related to the environment that didn't follow a clear profit motive, Cook bristled with a reply that "we do a lot of things for reasons besides profit motive," and recommended that anyone who had a problem with that "should get out of the stock." 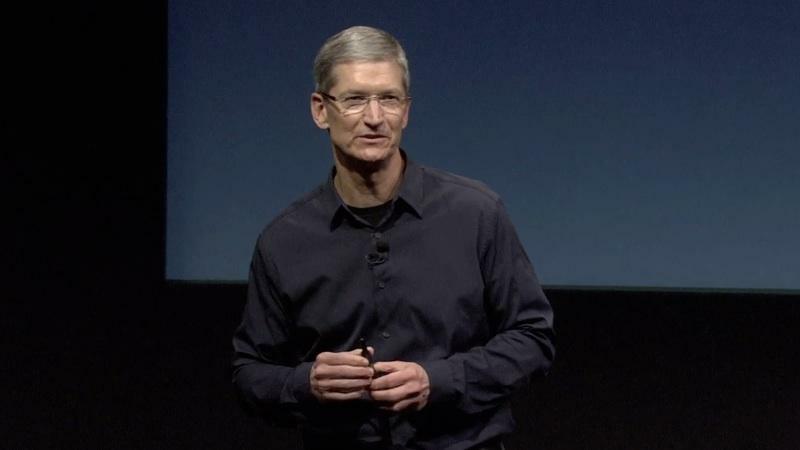 And while Cook stated that he didn't support specific shareholder proposals or certain outside ideas about how to best address human rights issues, he took personal issue with the comments some parties were advancing at the meeting, stating that Apple has taken a leadership position in human rights, taking on tough problems and "shining a flashlight on them" in an effort to affect change and push other tech companies to follow its lead. Two final questions fielded by Cook focused on Apple's work to bring manufacturing back to the U.S. and the status of the company's new Campus 2 headquarters, which he said would serve as an "innovation center for decades." Regarding U.S. manufacturing, Cook specifically mentioned Mac Pro manufacturing in Austin, Texas, and new sapphire production underway in Arizona, although he sidestepped any details about the nature or use of that new sapphire production. Cook also said that construction of Campus 2 is rapidly progressing following final approvals from the city of Cupertino in November, adding that Apple plans to occupy the new complex by 2016. Cook invited shareholders to attend the 2017 meeting scheduled to be held in larger facilities at the new complex, which wouldn't require outside overflow seating to accommodate all who wanted to attend.